Each Vascular Research Tools (VRT) or Vascular Tools (VT) license is locked to a single computer after the installation and license activation. 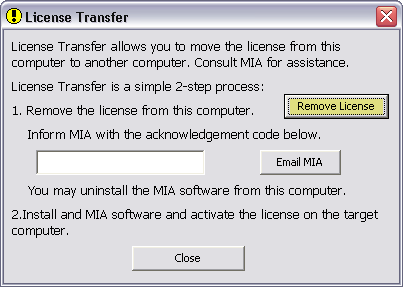 The license may be transferred from one computer to another. License transfer is supported as long as the total number of installations does not exceed the total number of licenses purchased. De-activate and un-install the license on computer A. Install and activate the license on computer B. Details of each step follow. Those steps apply to VRT or VT version 5.6.5 and above. Contact MIA if you have an earlier version. Log on the computer with an active VRT or VT installation to perform the following license transfer. Make sure you have the sufficient administrative privilege. Run the Brachial/Carotid Analyzer (for Research), go to the Help menu and then the Licensing. Click on the Transfer License button. 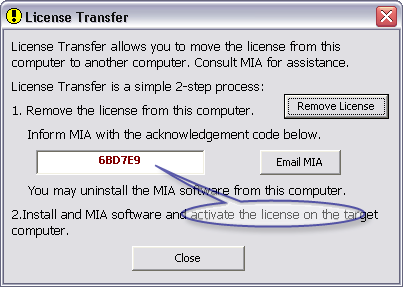 Note: earlier versions may not have this Transfer License button, email MIA at email address: support@mia-llc.com if this is the case and skip the steps below. Click on the Remove License button, and confirm the removal action. 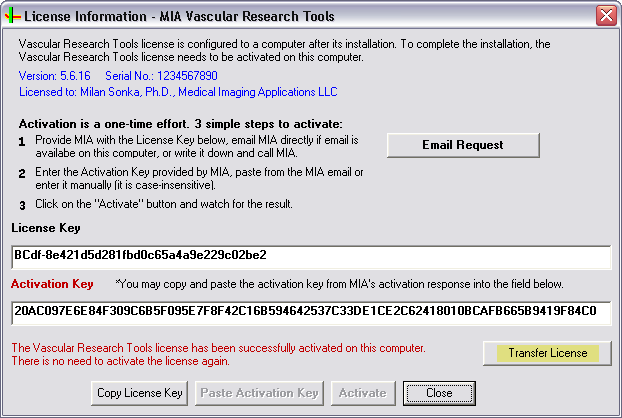 You may un-install the MIA Vascular Research Tools software on this computer. Log on to the computer on which the VRT/VT license is being transferred, make sure you have the sufficient administrative privilege. Install the VRT/VT software using the same installation media you used for installing on the previous computer. Activate the VRT/VT license the same way as previously - by emailing the license code to MIA and obtaining a new activation code from MIA.